The apartment Top 2 with separate entrance can accommodate up to 5 people and has a fully equipped kitchenette (dishwasher, dishes, refrigerator, coffee maker etc.) with dining table, a living room with sofa bed for 1 person (if necessary, on the sofa sleep two people) and satellite TV, also a bathroom with shower. One bedroom is furnished with 2 single beds, the second has a double bed and wardrobe. The large terrace (sun protection exists) offers a magnificent view of the sea and the island of Pag, where you can relax and recover from your everyday life. In the garden a barbecue is present, which is available to you. The house has a staircase to the sea, where there is also a small shallow bay for children. In the evening you can barbecue, relax and enjoy the view of the sea. The house has three apartments, Top 1 on the ground floor, Top 2 and Top 3 on the 1st floor. The bathroom is equipped with shower. Perfekt gewählt für einen spontanen Kurzurlaub mit Freunden. Das Highlight ist die Terrasse und der Wahnsinns-Meerblick! Netter Empfang durch freundliche Vermieter, die Unterkunft ist wie abgebildet hier, keine bösen Überraschungen, alles sauber und gepflegt. Ein kleiner Weg führt direkt vom Garten zum Strand, die Wasserqualität super, durch die Felsküste sieht man viel m bis zum Grund, glasklar. Alles zusammen ein super schöner Urlaub, der viel zu schnell vorbei ging. Wir bedanken uns nochmal für schöne Urlaubstage. Es wurde eine schöne, freundliche und saubere Wohnung zur Verfügung gestellt, WLAN, dt.TV, Liegen auf Terrassebwar alles vorhanden. Wir konnten einen schönen und erholsamen Urlaub genießen. Das Apartment war wie beschrieben, die Terrasse hatte den fantastischen Meerblickwie man auf den Fotos sieht. Die Vermietern war nett und bemüht. 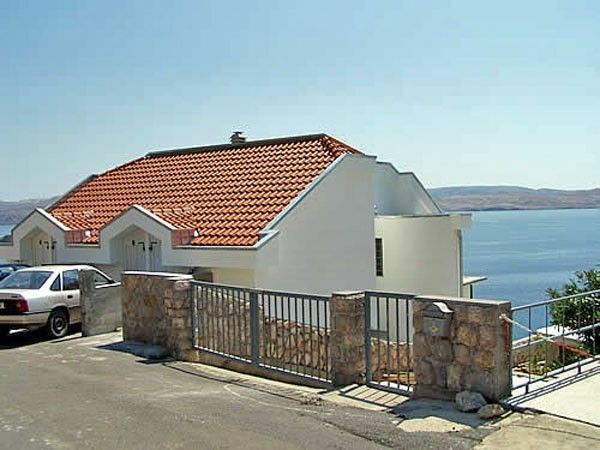 The house is situated in Cesarica Rukavina in Karlobag, quiet area and about 400 meters from the coastal road, right by the sea and is ideal for guests who are looking away in Croatia holiday away from mass tourism rest and relaxation. In addition, Karlobag surrounded by 4 National Parks, the islands of Pag and Rab, the coastal cities of Zadar and Senj and the holy mountains of Croatia, Velebit. The visit of almost 30 000 square meter nature reserve Plitvice Lakes is an unforgettable experience. The Plitvice Lakes are equipped with beautiful walking paths, so that they can be visited for its magnificent natural and access to the lakes in all seasons. Furthermore, you can find great boat trips to nearby islands of Rab and Pag, hikes, guided mountain tours by jeep and mountain biking in the Velebit National Park and Paklenica, and more offer. Recommended further look worthy goals are still the Krka waterfalls and the Kornati islands. About 30 minutes drive from the cottage is located in the Velebit National Park in a beautiful landscape of the theme park Rizvan City. The offer includes: paintball, climbing wall, ropes course, archery, quad biking, jeep safari, climbing in the Velebit, rafting, and much more. Especially for groups or families with teenagers the Adventure Park is the perfect destination during your seaside holiday at the sea. Klimaanlage bei Gebrauch: € 5/ Tag (vor Ort bei Eigentümer zu entrichten) Kurtaxe wird vor Ort extra berechnet.